Register for the next Packet Pushers Virtual Design Clinic at https://packetpushers.net/vdc. 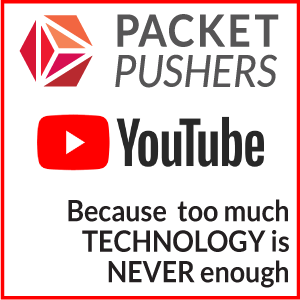 They are free, and you won’t get any follow up messages unless you opt-in to receive them.Packet Pushers has lots of other material aimed at IT engineers & networkers. Visit https://packetpushers.net and subscribe to our podcast network–over 1,000 episodes in our archives, with fresh content several times per week.